I’m racing around all weekend getting ready for a spontaneous house full of people next week, so I won’t be able to take advantage of this, but I sure hope you can. 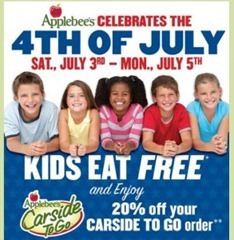 Kiddos eat free at Applebee’s from Saturday, July 3rd through Monday, July 5th! Plus you can get 20% off your “Carside To Go” order.